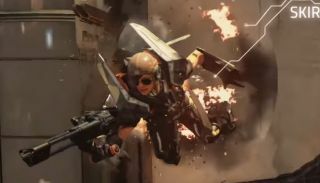 The debut trailer set the scene on Wednesday, but now we have the first in-game footage of Lawbreakers, a free-to-play shooter from Cliff Bleszinski's Boss Key Productions. The game is set in a future where the moon is gone and gravity is throwing a crazy party to celebrate. That explains the floating arena, which we see players navigate with the aid of a a neat grapple-and-swing laser lasso. The four characters shown fulfill different class roles in a fight. Kitsune is an assassin who can do lots of damage up close. Maverick can fly, and wields a gatling cannon. Breacher is your go-to first-character soldier type with a familiar assault-rifle-and-sidearm loadout. Cronos is a huge tank with a rocket launcher. I love the grapple-swinging, and the rest looks decent enough. However, there will be a lot of very similar games fighting for attention soon. Bllizzard has Overwatch; Gearbox has Battleborn and Valve's Team Fortress 2 is still as fun and free as ever. Has Lawbreakers won your heart with this first footage?